SKÖVDE, Sweden – February 16, 2016 – Pieces Interactive today revealed their newest title, Kill to Collect, an 80’s cyberpunk rogue-like with up to four-player co-op, set for launch on Steam later this spring. A new teaser trailer also made its debut, giving a peek at the backstory and bounty hunters in the game. Kill to Collect features challenging, procedurally generated maps and enemies galore, with quick bursts of intense gameplay that encourages players to learn from their failures and inevitable deaths. Kill to Collect takes place in Geoshelter Alpha, the last known city on Earth, where the lawless slums of the Deeper Levels are overrun by corrupt megacorps, criminals and degenerates. In this dystopian society, hired bounty “Hunters” stand as the last semblance of order in the midst of chaos. 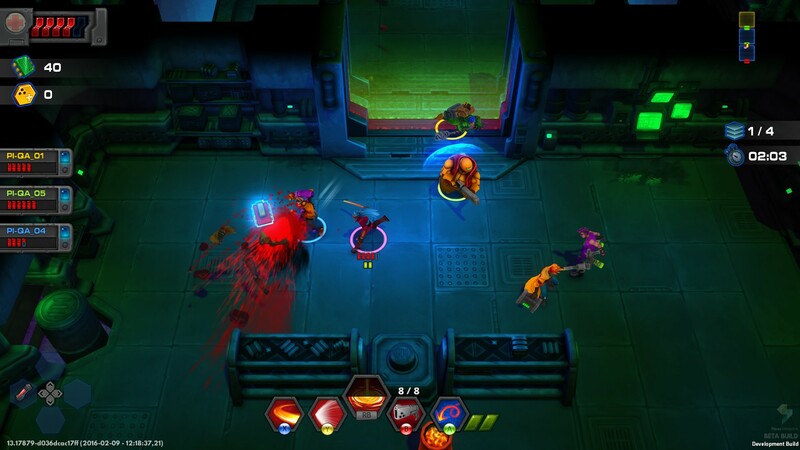 Players will choose from a ragtag team of four Hunters, each with their own unique abilities and fighting styles to help them defeat enemies and collect bounties. Whether their weapons of choice are swift swords, iron fists, riot guns, or even electrocution, the goal is simple: kill to collect. Thematically inspired by 80’s cyberpunk classics like Ghost in the Shell, Kill to Collect delivers a top-down, action-packed journey, complete with an original synthwave soundtrack. With three different game modes and a variety of weapons to discover and unlock, Kill to Collect supplies players with strong replay value as they discover new combinations of teammates, strategies and equipment. For more information about Kill to Collect and Pieces Interactive, please visit www.killtocollect.com. Follow Pieces Interactive on Facebook: www.facebook.com/piecesinteractive, or Twitter: www.twitter.com/PiecesInt for game updates and insights.